The AVG-HD550 consists of a Wall Plate Transmitter and a receiver which can transmit HDMI(1080P, 4K@60Hz 4:2:0), RS232 and USB signals up to 100m using a single CATx cable. 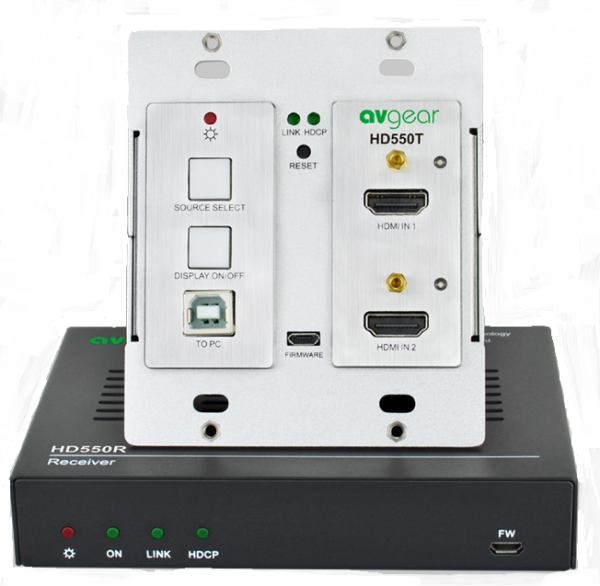 The Wallplate features two HDMI inputs and a USB-B port for HID devices such as a Mouse or keyboard. HDMI signal up to 4K@60Hz 4:2:0. HDBaseT technology extends HDMI, USB and RS232 signals up to 100m over CATx cable. Bi-directional RS232 pass-through with HDBaseT connection and local control. CEC control via the Display Button. 24V PoC, transmitter is powered by the receiver. Power Supply	Powered from the receiver by CATx cable.